A factor that is constantly overlooked in any debate comparing Scotland with England is the fact that, although the coastline of Scotland dwarfs that of England by a factor of three, it is nonetheless much more stable and not as vulnerable to global warming and to sea level rise that—surprisingly—conspire in Scotland’s favour. But—more importantly—they make the impact of the present flooding pale by comparison with what might come. It is not just that Scotland has relatively few low-lying coastal areas and considerably more high moorland and mountain terrain. Measurements taken over decades reveal that, while Scotland and Northern England are still rising faster than sea levels, Southern England is sinking at a rate that effectively doubles the rate of sea rise. Many don’t see that as a problem, given sea levels rise by a millimeter or two a year. But that is changing. There is a general consensus that global sea level rose by 20cm in the 20th century, But there is much speculation that it will be more this century, with many predicting around 40-50cm. Adding in the effect of sinking land would make that figure more like 55-65cm. The equivalent figure for Scotland is half—25-35cm. That alone would test sea defences on the relatively low-lying English coast but have minimal effect on the 10,000km of rocky, mostly mountainous coast in Scotland. But then consider some less likely but nonetheless real scenarios. The science tells us that warming seas accelerate the process: glaciers don’t regenerate; ice sheets (which reflect much sunlight) melt to expose darker sea (which absorbs it); The Arctic ice sheet has halved in area, opening up the Northwest Passage past Canada in the last two summers. Current estimates are that melting polar ice sheets contributed 11cm to sea levels in just two decades and this is accelerating fastest of all. This is where it gets scary. The melting of small glaciers and polar ice caps on the margins of Greenland and the Antarctic Peninsula melt, would increase sea level around 0.5 m. But collapse of the grounded interior reservoir of the West Antarctic Ice Sheet (WAIS) would raise sea levelsby 5–6 m. Melting of the Greenland ice sheet would produce 7.2 m and of the whole Antarctic ice sheet a whopping and catastrophic 61.1 m of sea-level rise. Anyone not living in Tibet or Bolivia ought to be concerned about this. Given recent fracturing of the smaller Weddell ice sheet, loss of the WAIS alone is a distinct possibility for this century and would drown several countries, including the Seychelles, Singapore and most of Holland. 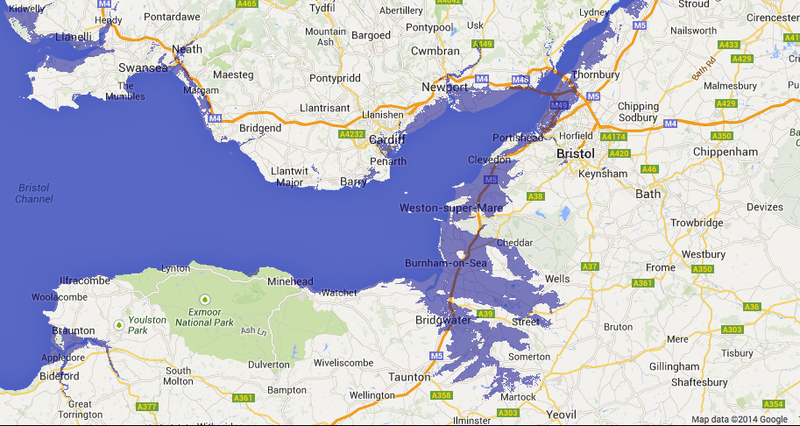 In this case, we are talking about an 8m (25ft) total rise in sea level in Southern England. Given the recent demonstration of the vulnerability of the Somerset levels, if the above occurs that part of England becomes shallow sea, much like the Wash.
Bad though that is for the folks of Somerset, it is relatively benign compared with the equivalent 8m scenario in Eastern England. That area has not suffered the nearly as much recently as the brunt of recent storms hit elesewhere. But it was hard-hit by the Fen Flood of 1947 and the Great Flood of 1953 which devastated swathes of Essex. 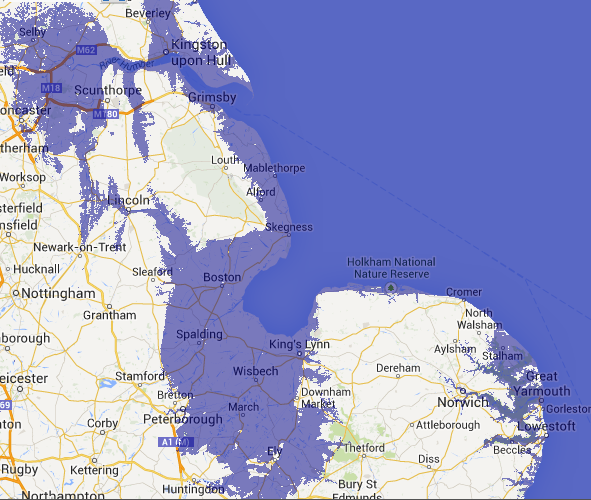 This area would actually be hardest hit of all by a steady sea level rise, as shown below. Here the scale is ten times worse, with over a hundred square miles of fertile farmland, hundreds of towns, plus Cambridgeshire and much of Lincolnshire lost to the sea. Though civil engineers could get clever and build big enough to protect the Somerset levels from inundation, such is the sheer scale of vulnerability here that no coherent defence against flooding is feasible. Though an 8m rise there would not tally up in terms of area like Eastern England, by far the worst flooding in terms of impact would be the Thames estuary. Greater London contributes £280bn to Britain’s economy—roughly one quarter in terms of gross value added and this would be substantially crippled by an 8m rise in sea levels—a situation in which the Thames Barrier would be so overwhelmed as to become little more than a navigation hazard. The entire estuary and docks area, both financial districts, Southwark, Westminster and hundreds of metres either side upriver to Richmond would be flooded and/or tidal. Half the mainline train terminii would be gone, the Tube flooded and the only public transport working would be the Thames catamarans. Massive flooding along the South coast, with coastal towns from Portsmouth to Worthing all gone, Thanet an island again and Uckfield able to build a marina, would be serious but trivial in impact by comparison with London. Were all this come to pass within the next century, even a large, leading economy such as England’s would be unable either to absorb its impact, or finance the scale of engineering required to mitigate—let alone combat—biblical disaster on this scale. And though other countries may not be hit as badly in proportion, the global economy would be crippled. England would need to look to its friends and, since swathes of Europe and the States would also suffer badly, one of the few countries least affected, probably disposed to help and close enough to do so would be Scotland—whether independent or not. Because of its rugged geography and rising landform, the equivalent maps for Scotland, while chilling, do not display anything like the catastrophe shown above for England. Though there will be major problems in Paisley and Falkirk/Grangemouth, some coastal farmland flooded and more robust bridging problems to be faced at Stirling and Perth, given flood defences for the Clyde, some 90% of the country’s economy could, with some adaptation, function normally. Indeed oil platforms are built to withstand waves larger than 8m, the associated storms that we’re seeing now would provide additional renewable power and that will come in handy with all England’s base-load nuclear power stations at Hinkley Point, Sizewell, Dungeness and Heysham knocked out by coastal flooding. 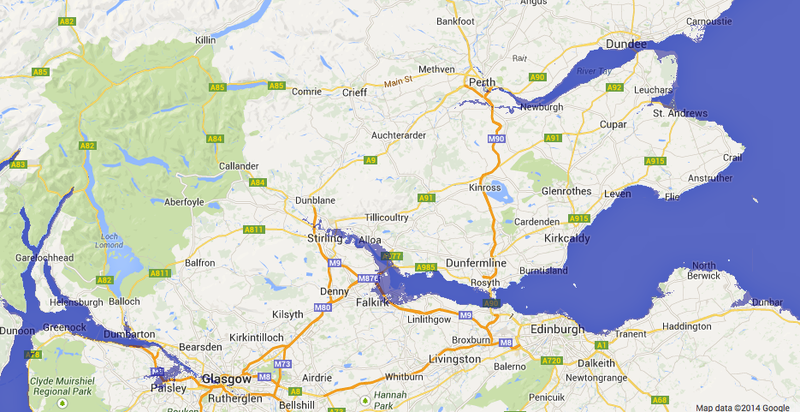 With plenty of space, Scotland would be able to house a significant number of the 8-10 million who would be rendered homeless by the sea. Many would enjoy a new quality of life close to the heart of things, revitalising areas of the Borders, Ayrshire, Fife and the Mearns. Others could find work further north in the booming offshore energy market around Cromarty, the Celtic Sea oil support industries growing up in Wester Ross or around the new Coronish gold mines around Tyndrum. All wild speculation? Perhaps: but a couple of thousand years ago you could walk from Holderness to Hamburg. So, when (rather than if) Canute does come Cnock-cnock-cnocking on England’s door, there will be—then as formerly—no holding back the waters. But the Scots won’t let them down, provided that—before being struck by tragedy on such a titanic scale—our English cousins bear such a scenario in mind and remember who their real friends are. This entry was posted in Environment and tagged flooding; global warming; sea level rise. Bookmark the permalink.